Frank Herndon Blackie began his military career in the Territorial Force. His biography in the Hillhead High School memorial tell us that for several years he was a member of Hillhead Company of the 9th Battalion Highland Light Infantry, also known as the Glasgow Highlanders. As such, he was called up at the outbreak of war in August 1914. At first, Territorial Force members were not forced to serve abroad and Blackie was one of those who volunteered for overseas service. As such he accompanied the 1/9th battalion to France on November 4th 1914. 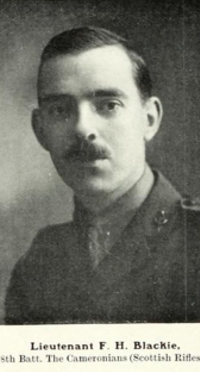 Battalion war diaries indicate that between the 25th and 27th of November, he would have received his first combat experience in the trenches near Kemmel. In May, he almost certainly took part in the Battle of Festubert, where his battalion suffered 214 casualties. Many of these men fell when the Glasgow Highlanders relieved the 52nd Light Infantry at Richebourg l’Avoue on the 17th. 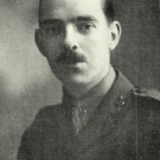 Blackie appears to have escaped any serious injury and remained with the battalion for several months after the battle. Evidence from the London Gazette shows that by the end of this period, Blackie held the rank of Lance Corporal, however it is unknown if he held this rank before arriving in France or as a result of the losses sustained at Festubert. 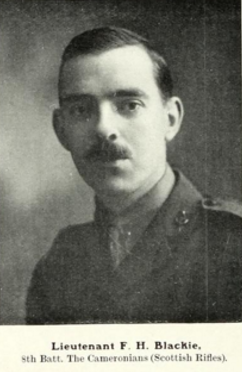 On the 18th of September 1915, the London Gazette announced Blackie’s commission to the rank of 2nd/Lt. in the 8th Cameronians (Scottish Rifles) and he returned to the UK to undergo officer training. As such he missed the heavy fighting at the Battle of Loos on the 25th of September. About a year later, Blackie responded to a call for officers for the little known East African Front. On December 2nd 1916, the London Gazette announced his temporary promotion to Lieutenant and transfer to the 3rd Battalion 1st King’s African Rifles (3/1KAR). The commission was dated November 18th, the same day that immigration documents show that he departed England on the ship ‘Balmoral Castle’, bound for the town of Chinde in Portuguese East Africa (now Mozambique). 3/1KAR was a newly created battalion and was still in the recruiting process in early 1917 when Blackie joined it at Zomba (now in Malawi). In May, Blackie was sent on a recruiting mission to Kaliwata, Nyasaland (near Chiponde, Malawi). Here he was captured by a German raid and remained a prisoner of war until November 1917 when he was rescued. During his captivity he wrote a diary which, according to the Hillhead High School Memorial, showed the Germans in more favourable light than many of the writings of the time. Blackie re-joined his battalion and was promoted to full lieutenant on January 1st 1918. He took part in the battalion’s move to establish a base in Mahua (Maua, Mozambique) in early April and on April 11th, was part of the detachment sent to capture the nearby German outpost at Koriwa. However, the attack did not go as planned as the Germans aggressively counter attacked. ‘B’ Company’s commander was captured and ‘C’ Company was forced into a fighting withdrawal. The whole detachment was forced to retreat, leaving behind their dead and wounded. Amongst them was Blackie, who apparently fell while commanding one of detachment’s machine gun sections. 28th August 1886 at 24 Hamilton Park Terrace, Hillhead, Partick, Scotland. Blackie was Killed in Action while commanding an Askari machine gun section in a skirmish near Koriwa, Portuguese East Africa. Memorial Dar es Salam British and Indian Memorial in Tanzania. 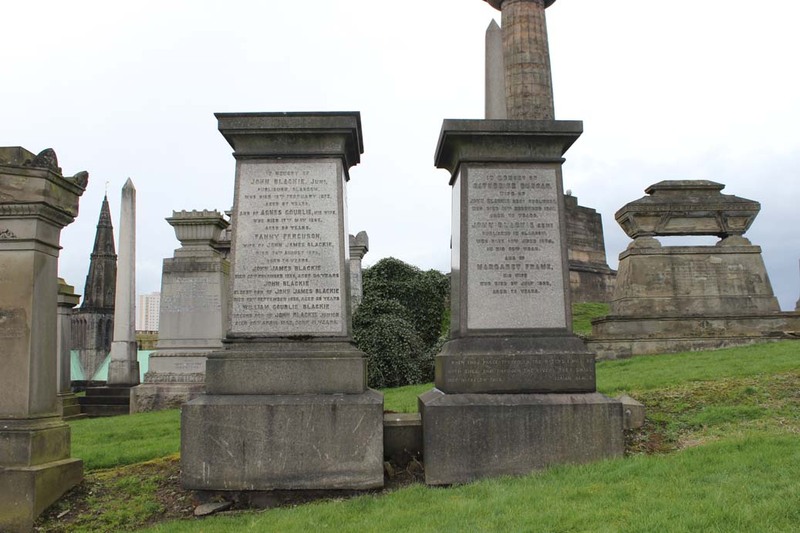 Son of John James and Fanny Ferguson Blackie of 24 Hamilton Park Avenue, Hillhead, Glasgow. It further records that Blackie volunteered for active service August, 1914 and proceeded overseas in Nov. 1914. 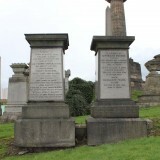 John J Blackie (c1851-1935) & Fanny Ferguson (c1851-1925), married 1876. It varied – sometimes he is described as a merchant, at other times as the manager of a chemical works and at other times as living on his own means. Clerk with Hodge & Smith Chartered Accountants, Buchannan Street. 13 Hamilton Crescent, Govan, Glasgow, Scotland. 1918 – 24 Hamilton Park Terrrace, Hillhead, Glasgow. Blackie’s elder brother Albert is also on the Necropolis Roll of Honour, having been killed at the Battle of Arras on April 14th 1917. 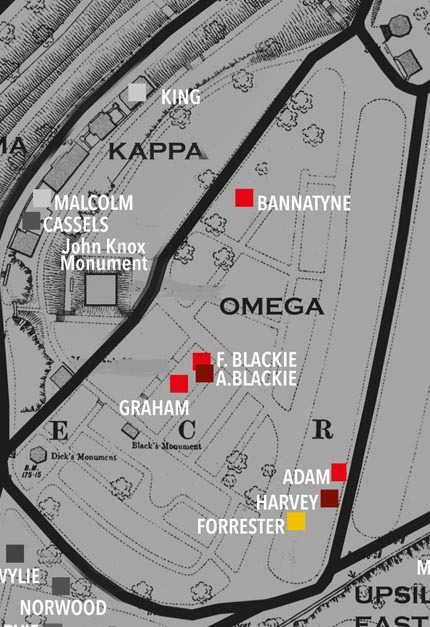 Blackie was a member of the Blackie publishing dynasty, his grandfather being a partner of the firm. He died intestate and left an estate valued at £417 13s 6d. Hillhead High School War Memorial Committee (1921) Hillhead High School War Memorial Volume. Glasgow: William Hodge & Co.
Aiken, A. (1971) Courage Past: A Duty Done. Glasgow: George Outram & Co.
Oatts, L. (1961) Proud Heritage: The Story of the Highland Light Infantry, Vol.3. Glasgow: The House of Grant Ltd.
City of Glasgow (1922) The Roll of Honour of the Citizens of Glasgow who died in the Great War 1914-1918. Glasgow: City of Glasgow Council. 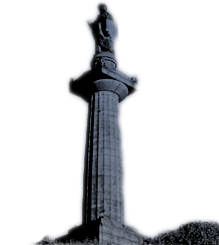 Compiled by a Euan Loarridge, University of Glasgow and edited by Morag Fyfe, Historical and Genealogical Researcher for The Friends of Glasgow Necropolis.